The Hexagon Shape is a six-sided polygon (hexa meaning six). Polygon is a word used for any shape that has multiple sides. There are two types of polygons: regular and irregular. In a regular hexagon, all six sides are of equal length and the interior angles are 120 degrees. In an irregular hexagon, there are still six sides, but the lengths are different. 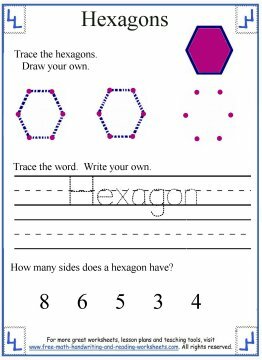 Use the worksheets below to introduce your child to this geometrical shape. 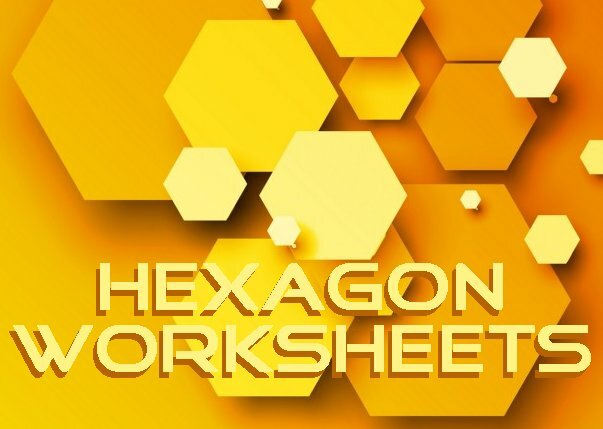 The 1st worksheet will ask the student to trace the shape and then draw a hexagon free-form. If you've done some of my previous shape worksheets, then you know that the introductory worksheet usually has a real-world shape identifying activity below the tracing section. 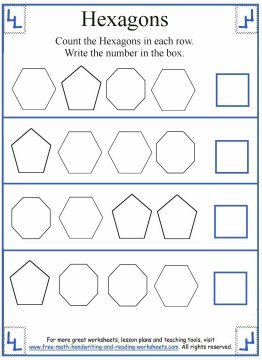 I couldn't find many hexagon graphics that I thought were decent enough to use so I included a simple word tracing and writing task instead. While this doesn't reinforce the shape as much as the other activity would have, it still helps to improve fine motor skills which are needed for drawing hexagons. 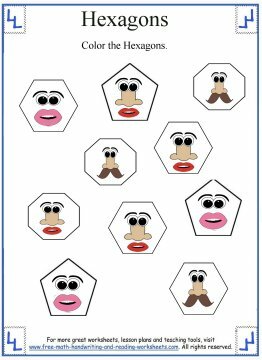 The next paper is a simple identifying task with some funny faces on three different polygons. The child will need to color the hexagon shape only. To make sure that students were focusing on the shape and not the faces, I put each face on different shapes. If you are working on multiple polygons, you could have the student color the pentagons and octagons a different color as well. Next, there is a maze with multiple polygons of various sizes: hexagons, pentagons, and octagons. 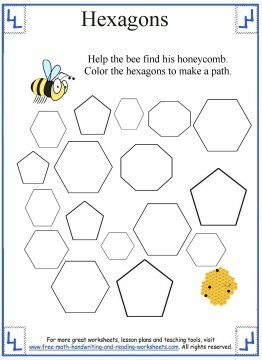 The child will need to color in the hexagons to complete the maze and get the bee to his honeycomb hive. In the final printable, there are four rows of polygons. For each row, the student will need to count the hexagons and then write the answer in the box provided. For those of you working on multiple geometrical shapes, you could also turn this into a coloring worksheet. For example, have students color all hexagons blue, pentagons purple, and octagons orange. There are different ways to use the worksheets so work at your child's pace using whichever way he or she learns best. My son does not like coloring, so we'll turn a lot of coloring tasks in to counting tasks. I've created a lot more lessons covering both 2D and 3D shapes. Check out the lessons below and for extra help with drawing shapes, be sure to visit the tracing lesson. For a fun activity on identifying shapes, don't forget to download the dot to dot puzzles I've created. Thank you for visiting the site!